Illuminate your home with the warm flicker of candlelight cast by these handmade Murano Glass Votives (table top candle holders). Perfect for creating an elegant holiday atmosphere or for an added touch of sophistication any time of year. This color is a transparent black, when viewed through the light it appears like a deep fume (smoke) color. 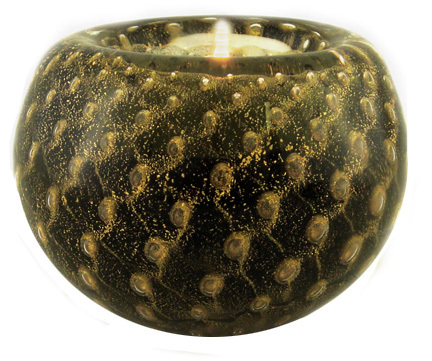 Designed for use with tealights, each votive is made by artisan glass blowers on the island of Murano, Italy. Approximately 3 1/2 inches in diameter and 2 inches tall and weighing over 16 ounces. Tealight included.